After the German Spring Offensive of 1918 was stopped, German morale waned and the increasing numbers of American soldiers arriving on the Western Front gave the Allies a growing advantage over the German forces. Continuing Marshal Foch's offensives, a combined attack with British, Belgian and French forces struck at the German Army within the Ypres area of Flanders. The British Second Army's objectives were to the south and east of Zonnebeek; ground which had been fought over for four years and which British troops had surrendered earlier in 1918. II Corps with 9th(Scottish) Division, 29th Division and 36th(Ulster) Division as reserve occupied the left (northern) end of the British 16 mile front. To the British' left were the troops of the Belgian 8th Division. An intense artillery bombardment shortly before 05.30 on 28th September preceded the attack over ground made muddy by days of heavy rainfall. The advance went well, with 9th Division attacking towards Broodseinde Ridge, by 08.00 Westhoek had been captured and the infantry paused to allow the following artillery and stores to catch up. Stiff resistance was met on Anzac Ridge, but under cover of smoke shells the barbed wire defences and numerous pillboxes were isolated and attacked successfully, so that by mid day 26th and 27th Brigades had secured all their primary objectives, from Polygon Wood to Broodseinde Ridge. By evening Becleare had fallen, despite the spirited resistance of its defenders; by nightfall the overall British advance averaged six miles for the day, with the Belgians experiencing similar success. 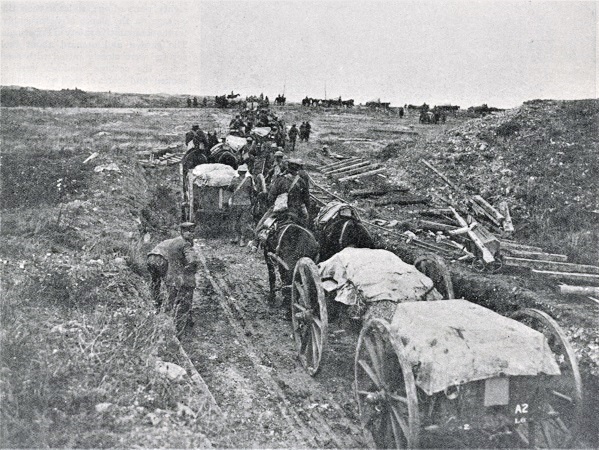 For the following three days increasing rainfall limited the advance; in addition to the difficulties on the battlefield, the poor condition of the roads made transport movement slow, delaying the supply of rations, fresh water, ammunition and reducing the ability of the artillery to keep pace with the infantry. The German resistance also increased indicating that much needed reinforcements had arrived behind their lines.